People that love animals, truly love animals, should have a paw shaped jewel in their crowns. Way to go! Hooray for FURever homes!!! We are so happy that you did and found such a wonderfully loving home. Wow, you traveled a long way to find that forever home, Benny. And we bet you are very glad you did. Nice pic of you and Mom. Oh forever home stories always have the best endings. Benny your Meetup place was spectacular & dramatic !! No one could resist you in such a backdrop. Thanks for sharing. It is always best to get a dog who needs a home. Blessings to Mom & Deb. I didn't know you was a rescue, Benny! Mee, too!! heehee: our variword is "mates"!! awww...what a wonderful story Benny! Benny you are a lucky duck! So glad you have such a loving home and you get to hang with Lily! That is such a great story...and you have such a GREAT forever home! Lovely story with a happy ending, forever homes are certainly the best. We're so glad you found the bestest forever home! Does this mean you're a Stillers fan? Ha roo! Those are some SWEET pix, buddy! We're so thankful to the transport lady for bringing you HOME!!! PS: Hey, our mom was born in Pittsburgh. Maybe you're related. Ha roo roo roo! Awwwww Benny. So sweet. So much deserved LOVE. Great pics!! You came a long way. But we know it was worth it! Wow, what great pix! I live about 2hrs from Pittsburgh. We were practically neighbors! You are definitely in a much better spot now in your perfect pack. Benny, I did not know you were a rescue?! What a lovely story and happy beginning for you. That is awesome ... it sounds like you got a wonderful forever home and family! 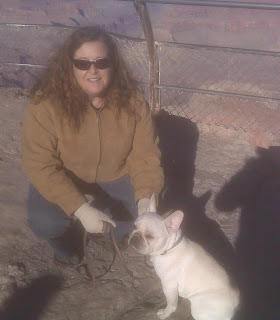 WOW, oyu went West, got a new home and saw the Grand Canyon!! What a deal!! Glad that you are happy!! What a happy beginning for you Benny! And boy! Do you have a great forever home! Madamoiselle Gucci Poochie 'Lisbet Skoog was brought up here from Tennessee and Phoebe Bluegrass was driven by 5 different people between Kentucky and Brockport. We could not be happier with them. You REALLY got a GRRRREAT Furever home... FUR SURE. Forever homes and happy endings for a beautiful baby. We are celebrating your good memories with you today! pughugs from Texas! Wow, Benny...you are a well travelled guy. Bet it was love at first sight! You have the most perfect forever home, Benny! How cool! Love the pictures! Awww!! What a sweet memory! Is today your Gotcha Day? Just wondering. You traveled a long way to find the perfect mom and home! Thanks to the transport lady! Do you have a Pittsburgh accent? It's an odd accent... especially if combined with a French accent. That's terrific! There's a lot of love that led to your forever home! What a drive, but it turned out so darn GREAT eh? You sure did get lucky finding a Mama to take such great care of you. You chose her well. Benny, you've got yourself a great forever home! We are so happy that you have an awesome, loving forever home. They are wonderful, aren't they? This was like the most beautiful love story there ever was! And now a forever home! Total awsome. It was ment to be. Wow! You came a long way. We're all fur furever homes! Oh, how sweet is that! Nice story with a very happy ending. I bet you had no idea you would have such an exciting life! Rescue People ROCK! LadyBug is a rescue too! We are very glad you are so happy in your furever home!! Wow! I didn't know you were fom Pittsburgh! 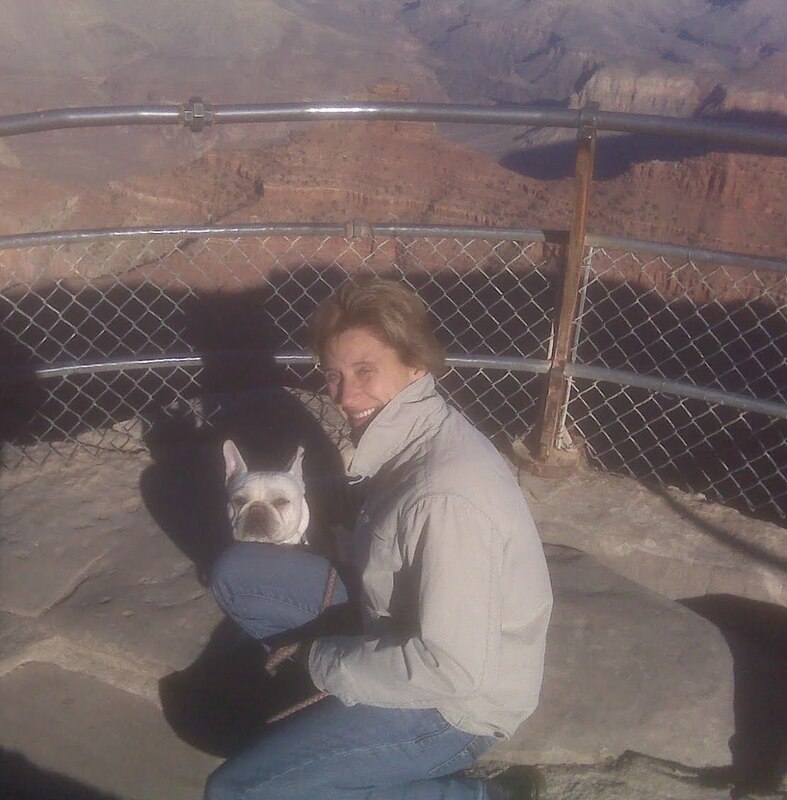 It was so nice that you got a ride all the way to the Grand Canyon. Clearly your Momma is very pleased that you two found each other. Ben, buddy.....you are the luckiest Frenchie I know. Well, buhsides Lily. PEE S: Pittsburgh to the Grand Canyon?! There is a special place in heaven fer that transport gal I tell ya what!